Ballet Book Nook s is a unique needlepoint canvas from Alice Peterson. It features book spines of ballet books lined up on a shelf with a ballerina figuine. The design area measures 12" x 12". 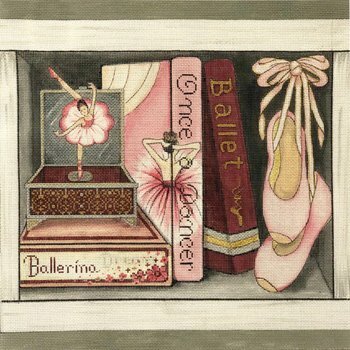 This Ballet Books needlepoint can be purchased with or without fibers. If you select cotton we will send DMC cotton floss. For wool we use Bella Lusso and silk we will send Planet Earth fibers which are single-ply. If you need stretcher bars we recommend TWO pair of 16" bars and some thumb tacks.